Meanwhile, for this "episode" of my Tuesday's Truths series, I'm sharing what I've learned about them. 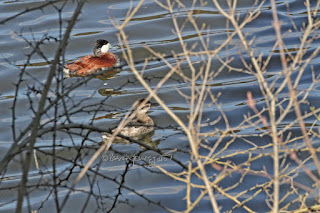 According to a number of sources including page for bird-web, "...The Ruddy Duck is stiff-tail ducks, known for holding their spiky tails up in the air. They have large, flat bills, small wings, and feet set far back on the body. 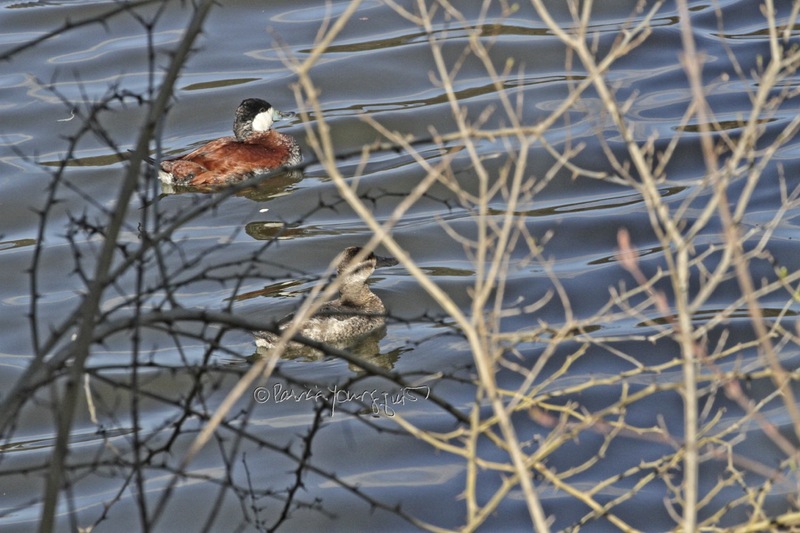 The male Ruddy Duck is cinnamon in color overall with a black head, large, white cheek-patch, and bright blue bill. The male in non-breeding plumage has a mottled gray body and gray bill. 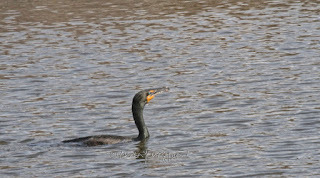 The markings on the head are similar to those of breeding plumage. The female is mottled gray overall with black on the top of her head and a dark, horizontal line that bisects her white cheek. Her bill is gray. 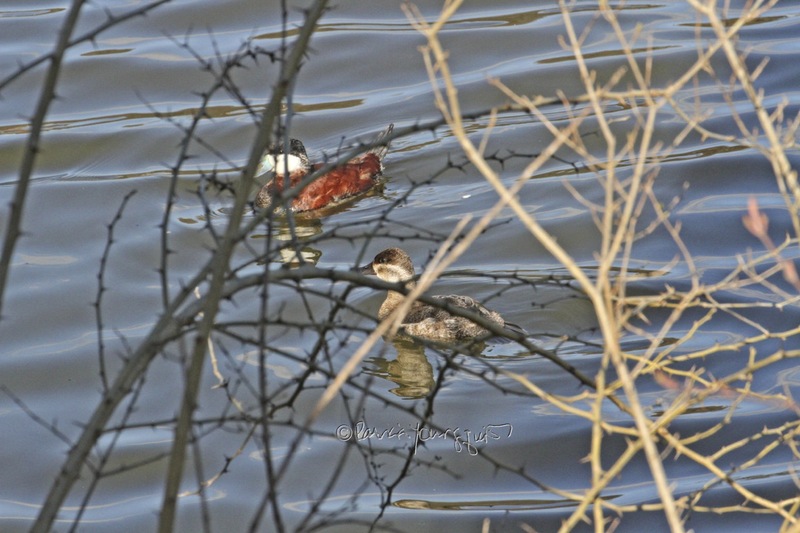 The juvenile is similar to the female, but the black on its face is less pronounced." 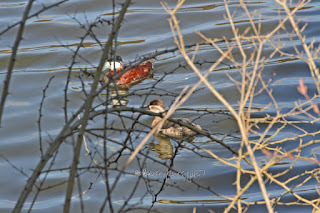 As I said I first encountered this duck type last April. 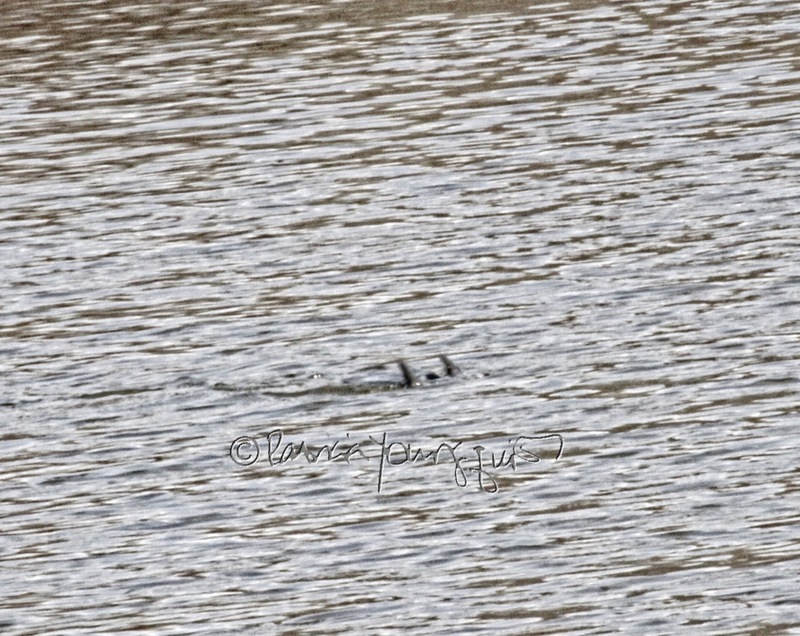 It place at the Jacqueline Kennedy Onassis Reservoir, and I never saw one after that time so it was a great surprise to see this pair in the lake. 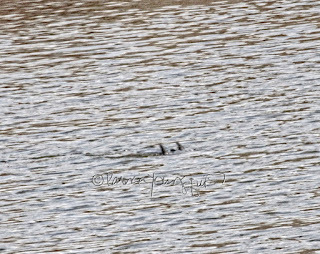 Yesterday I went back to the area of the lake where I had first seen them in hopes of getting better pictures but there were no Ruddy ducks in sight. 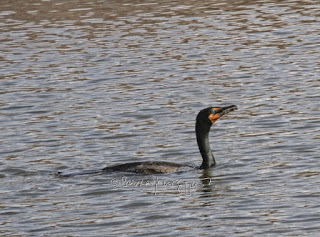 However there was a lone cormorant who can be seen in the next two pictures. As is the case re info for Ruddy ducks, bird-web has something to say re cormorants: "They forage in shallow water within sight of land. 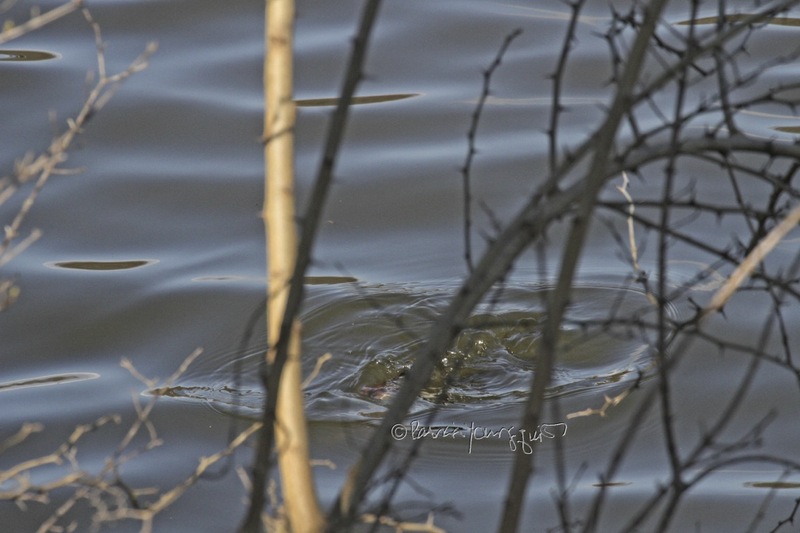 They dive from the water's surface to pursue prey underwater, propelled by powerful, webbed feet." 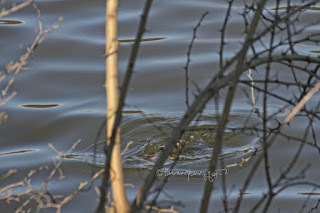 My photo of a cormorant in deep dive mode is fuzzy at best, but it can be seen below, and you can see the bird's tail poking out of the water which should give you a senses of how the cormorant appears as he is about to go under in search of food. Bird web goes on to explain, "After a bout of foraging, they may be seen on exposed perches with their wings spread, drying their feathers (and) males attract females by performing a conspicuous 'wing-waving display' that emphasizes their colorful head-tufts and neck." I have witnessed this behavior and have photo-ops of it within a prior entry here on Blogger. 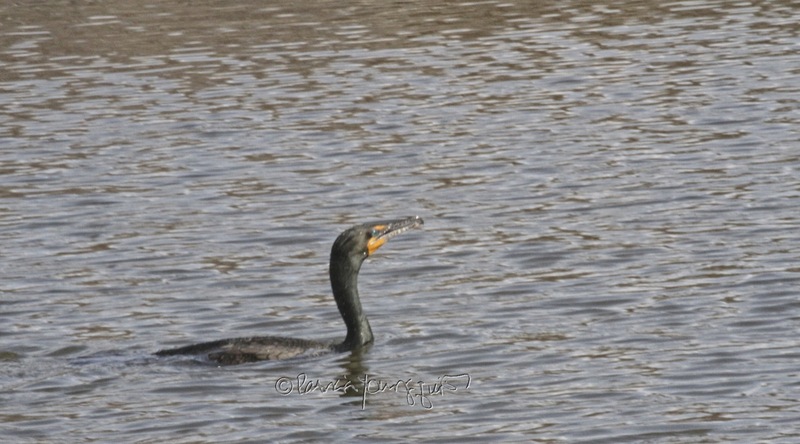 Btw, cormorants are featured in volume three of my book series, Words In Our Beak.